Don’t forget to put a little something under the tree for yourself! Canon has some holiday deals going on through the 6th of January! So take advantage while the savings is here! Posted on December 21, 2017 December 21, 2017 Author englewoodcameraCategories Digital Photography, Sales and Promotions, UncategorizedLeave a comment on Don’t forget yourself! Capture [v3] – Clip for rigidly carrying any camera on any belt, strap, or bag. Slide (2017) Pro camera strap with unmatched versatility, stability, and aesthetics. Thursday, June 22: Join Englewood Camera, Fujifilm, and Erin Brinkley-Burgardt for a fun-filled evening making pictures in Denver’s RiNO district! Test drive the latest Fujifilm X-Series equipment, including the new GFX 50S medium format, the X100f, and all of the current X-Series lenses. Led by professional X-Series photographer Erin Brinkley-Burgardt, this evening will be a fun shoot exploring urban landscape, street photography, and the love of photography. Larry and Luis of Fujifilm will be on site for tech support, and we will enjoy apps and drinks at the Walnut Room. Space is limited to 15 participants, so please register online today! Details will be emailed to participants the week of the shoot. Englewood Camera’s photo-finishing lab just had a recent printer upgrade, and we’re selling our old Epson Stylus 7880! We’re asking $800 for the printer, and we have 11 new-in-box ink cartridges for $50/each. Swing by the photo lab to check out the printer, or for more information call lab manager Brandy at (303) 795-2400. 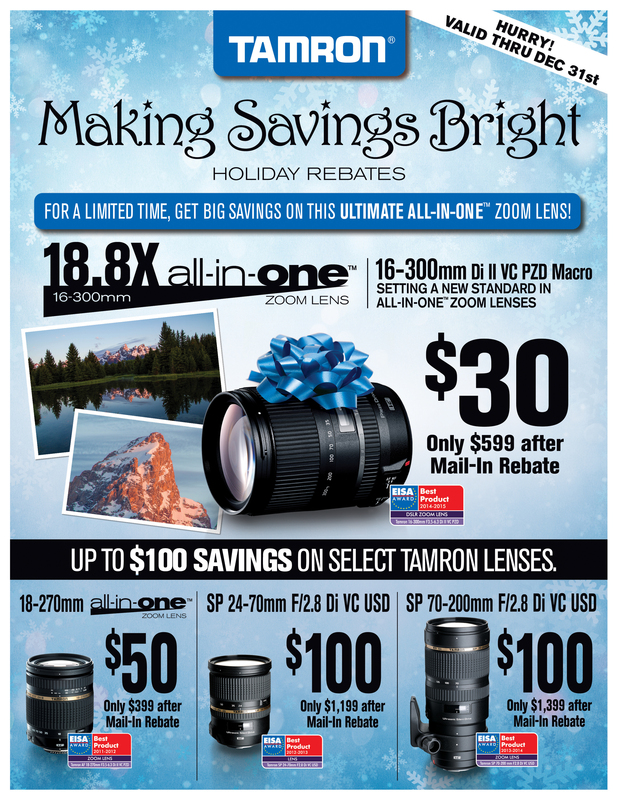 Great holiday savings from Tamron! Looking for the perfect new lens to add to your gear? Tamron has a great selection of lenses to fit a variety of needs! This holiday season, save some money when you invest in Tamron lenses–these lenses are great alternatives to the name brands, and are beautiful quality! Add Tamron to your Christmas wishlist this year! Posted on December 4, 2014 Author englewoodcameraCategories UncategorizedLeave a comment on Great holiday savings from Tamron! Great Deals on New and Used Camera Gear this Weekend! Well, folks, it’s that time of year when holiday shopping is getting revved up–only 19 days left until Christmas! If you’re out and about shopping this weekend, please consider supporting your local camera store, Englewood Camera! We have great deals on new and used camera gear, and we’ve got a wishlist waiting to be filled out to satisfy your photo needs. If you are in the market for a new camera setup, check out our Sony Demo Days this Saturday from 10:00am – 4:00pm. Sony Photo Specialist Marc Morris will be in the store with cameras and lenses to demo, including the highly coveted Sony a7 full-frame. We have instant savings available on Sony NEX-3N’s, Sony NEX-6’s, Sony a58’s and more–stop in for details! Not a Sony buff? That’s fine! Englewood Camera is offering great savings on Fujifilm, Canon, and Olympus too. Great deals are available on the Canon EOS Rebel’s, from the T3 to the T5i, with more savings when you bundle lenses! Check out the new X-E2 from Fujifilm while you’re here, and save money when you purchase additional lenses! Now in stock: the new, award-winning Olympus OM-D E-M1! We have limited supply of this popular model, so stop by soon! Rebates are available on select M4/3 lenses right now; see store for details. Looking for used glass or cameras? Englewood Camera can help you out! As the premiere used dealer in the Denver metro area, we specialize in all brands, from Canon and Nikon to Leica, Sony and Olympus to Fujifilm! We have some great deals this weekend, and all used equipment comes with a 6-month warranty! Check out our in-store sale on pre-owned compact cameras! Englewood Camera has great point and shoots available, including a Fuji X20, Ricoh GR Digital IV, and more! A few of these cameras are on sale for 10% off with an extended warranty. Have a fun, warm weekend! And, as always, thank you for your loyalty at Englewood Camera. Posted on December 6, 2013 December 5, 2013 Author englewoodcameraCategories UncategorizedLeave a comment on Great Deals on New and Used Camera Gear this Weekend!